RNA sequencing is used to examine the continuously changing cellular transcriptome. 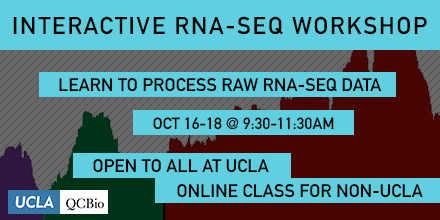 First, this workshop provides an introduction and the basics tools to process raw RNA-seq data on a cluster machine (Hoffman2). This workshop can serve as a starting point to develop a gene expression project. To facilitate learning, we will explore a hands-on tutorial that guides students in processing the data from raw reads through read counts. We will use a real-case study-based approach appropriate for Illumina read data.